When Benji was only a few months old, he clearly showed some interest in my iPod Touch. I always have my iPod Touch on me, and often read my email when I’m in the monkey room with him since it is kinda sturdy. He always loves to grab this thing out of my hands and if I don’t watch out, he’ll run towards the water bowl to give it a bath. Yes it is a miracle my iPod Touch is still alive! Just recently I decided to find out which program seems to peek his interest the most. Anything that flashes on this device clearly seems to interest him, but there are 2 programs he actually likes to play with. Cat Game (by Michael McMahon) – it’s a free game originally intended for cats. You pick a surface, select a time limit and off you go. A laser pointer will move accross the screen and each time your monkey grabs it, the laser pointer disappears. Benji seems to enjoy eating the laser point probably because the touch screen react better with his mouth than when he uses his nails instead of his hands. It’s so cute when the dot disappears because he “grabbed it” and when he opens up his hand to see if he’s got it. Cat Toys Lite (by Second Reality) – the lite version is of course free but if your monkey likes it, you might consider getting the full version for $0.99. In the free version a pink mouse races around on the screen. Each time your monkey touches the mouse it, the mouse responds. The full version comes with a mouse, rat, ping pong ball, frog, and spider. 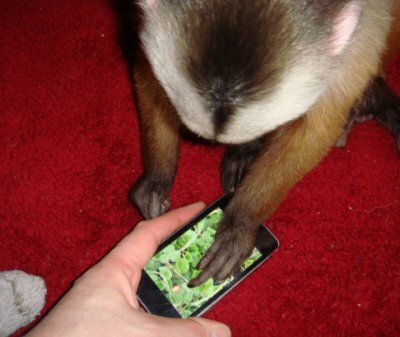 Let us know if your monkey seems to have an interest in other apps on iOS or Android so we can add them to this list.